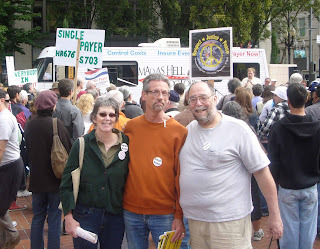 The Mad As Hell Doctors Care-A-Van national tour got its kick-off start in Portland OR on Tuesday morning. Our cross-country mission: to stop in big cities and whistle stops alike, conducting pre-booked, local and national media appearances for a curious press. Every move we make along the way will be recorded on camera and then edited and uploaded to the internet that same day. This will allow our Mad As Hell Doctors Tour to leverage the edited video segments on social networking web sites such as Facebook, Twitter, YouTube, MySpace, et al. In this way, our effort becomes an unprecedented hybrid of reality television and political activism that offers people the opportunity to follow us, in real time, as our story unfolds. The message will be unmistakable: caravan with us to Washington and help make a public demonstration of support for Single Payer Health Care that will be heard around the world. Imagine... Thousands of cars pulling into the nation's capital for a protest on the White House lawn. The sidewalks are filled with supporters carrying signs in support of the Mad As Hell Doctors who have captured the imagination and the ignited the passion of their fellow citizens. We wave and honk at the camera crews, as do the endless line of cars behind us, as we wend our way toward the White House. On every antenna, on the backside of every car, and flapping like flags from sidewalk supporters, is the symbol of this new movement: the White Ribbon. You can be a part of this people's movement for Single Payer Universal healthcare, not health insurance for profit. Go to the Mad As Hell Doctors website and check out the route to DC. They plan to be there September 30/October 1 with 19 stops along the way. You can help them with travel expenses by donating at their website. More pictures from the rally here!